What Hi-Fi? Awards 2018: Sonos and Audio Pro are multi-room kings | What Hi-Fi? Multi-room audio has become a staple of hi-fi and home entertainment, with more and more manufacturers imbuing their products with house-filling streaming capabilities. And this year at the What Hi-Fi? Awards 2018 we’re championing two manufacturers that stand out a mile in this category: Audio Pro and Sonos. The surprise new winner here is Audio Pro, knocking out Bluesound to share the podium with Sonos. The Swedish company has made a name for itself, producing incredibly musical wireless speakers for very affordable prices (you’ll see its considerable presence in the wireless speakers Awards category), but when it made its way into the multi-room market, we knew the current class-leaders were in trouble. Because the Audio Pro system sounds lovely. Its expressive, nuanced and precise performance is astonishing at its sub-£1000 price range, and delivers a musicality that’s unrivalled by anything at a similar price - or even a lot more. It may not be as slick to use as a Sonos system, but for its audio performance alone, the Audio Pro multi-room system is utterly deserving of its first Award win. The fact that Sonos keeps on winning – for the fifth year in a row now – should be of no surprise to anyone. Its portfolio of products keeps getting stronger every year, and it combines sound quality, ease of use and exhaustive features in the most confident, effortless way. It also remains the most intuitive system to use, with its agnostic approach to voice assistants and streaming services making it hugely appealing to a wide audience. The biggest shock this year is Bluesound, which doesn’t pick up a 2018 Award at all after four consecutive years as our multi-room Product of the Year. It also means this is the first time since the category’s inception that we don’t have a winning multi-room system that supports hi-res audio. Some might see this as a step backwards – but we believe that hi-res support alone isn’t enough to garner an Awards trophy, or even a five-star review; the entire system needs to sound fantastic with it as well. 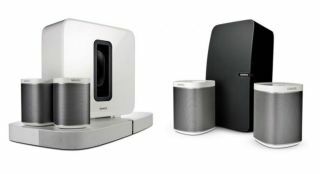 While there are some superb products in Bluesound’s Generation 2i line-up (the Powernode 2i and Node 2i win Awards this year), the pricey system as a whole doesn’t live up to its once-winning ways. The only question that remains: will Sonos or Audio Pro win the coveted Product of the Year gong? All will be revealed on the night of Wednesday 7th November, so stay tuned on whathifi.com and our social media channels for the final reveal.